Such an amazing game. It’s a great time killer when ever I’m bored I love to play this game I really do recommend this game it’s amazing for all ages ! Ok the game is rilly fun but make a Barbie doll . Be prepared I have a lot of complaints about this game. In the challenges you should add a revive button that you have to pay 50 coin things to revive, I also think that you shouldn’t be able to get doubles of certain characters, and if you do get a double not have to pay coins or watch an ad to get a replacement, for languages you should also add Irish, but other than that I enjoy Crossy Road. I see that a lot of people playing a game called Pecking Order. I don’t have that game and I want that game, but I don’t know how to get it. Please help and respond. Thank you. Very good game, just one problem. I can’t get the bashing beaver. I have collected the 10,000 coins but when I tap on it, it doesn’t give me the character. It just goes back to the “choose your character” option. Still a good game though. Best game ever!!! !Best game ever!!! !Best game ever!!! !Best game ever!!! !Best game ever!!! !Best game ever!!! !Best game ever!!! !Best game ever!!! !Best game ever!!! !Best game ever!!! !Best game ever!!! !Best game Best game ever!!! !Best game ever!!! !Best game ever!!! !Best game ever!!! !Best game ever!!! !Best game ever!!! !Best game ever!!! !Best game ever!!! !Best game ever!!! !Best game ever!!! !Best game ever!!! !Best game ever!!! !Best game ever!!! !Best game ever!!! !Best game ever!!! !Best game ever!!! !Best game ever!!! !Best game ever!!! !Best game ever!!! !Best game ever!!! !Best game ever!!! !Best game ever!!! !Best game ever!!! !Best game ever!!! !Best game ever!!! !Best game ever!!! !Best game ever!!! !Best game ever!!! !Best game ever!!! !Best game ever!!! !Best game ever!!! !Best game ever!!! !Best game ever!!! !Best game ever!!! !Best game ever!!! !Best game ever!!! !Best game ever!!!! I like it but it needs more characters even though there is a Disney one too I mean we also like Disney but some more funny looking animals maybe to make it more fun and silly but after all it good. It’s the best whenever your on the road you should download it especially when you have 5siblings. Download Crossy Road it’s amazing! I loved the idea you Had. Crossy road is awesome 🦄!!!!!!!!! I love crossy road but the problem is that when you die you dont get a chance to revive where you were. Hi my name is Sophia and I think that this game is............ SPECTACULAR!!!!!!!!! I noticed that this game is pretty laggy. It won’t move please fix this. I love this game so much! It is so fun and there are so many cute avatars you can unlock and it is really entertaining! I 100% recommend this game. Awesome game I cannot live without it. I love how they stay current even celebrate the coming of winter with playable characters like the snow king and dragon rider. Not fun. Win a prize in 3 minutes? No! I just wanna play. It pops up every 45 seconds. I really love this game. One reason I like it is there are lots of cool and cute characters. Also if you like one you can buy it for money. The game is also fun because all the characters have different worlds you can play in. I would absolutely suggest this game to people of all ages. That is why I love this game. The daily events (whatever it's called, in the top left corner) is filled with players that don’t exist. I play each night and usually end up in the top 20. However, none of the other top 20 players are ever the same. That’s impossible. Why do this? Also, some of the Canada tees make the most irritating jump sounds. Unplayable! To be completely honest, this game is only ok. I could not play it for hours on end like I do for games like Fortnites, or the Sims, I can only play so much until I get really bored. This game is a great time filler between things if you need it. Hipster Whale did a good job of taking a classic and reinventing it. Overall this game is decent. To the developers: if you added certain challenges with coin rewards then this game would attract some more playing time. Thanks! 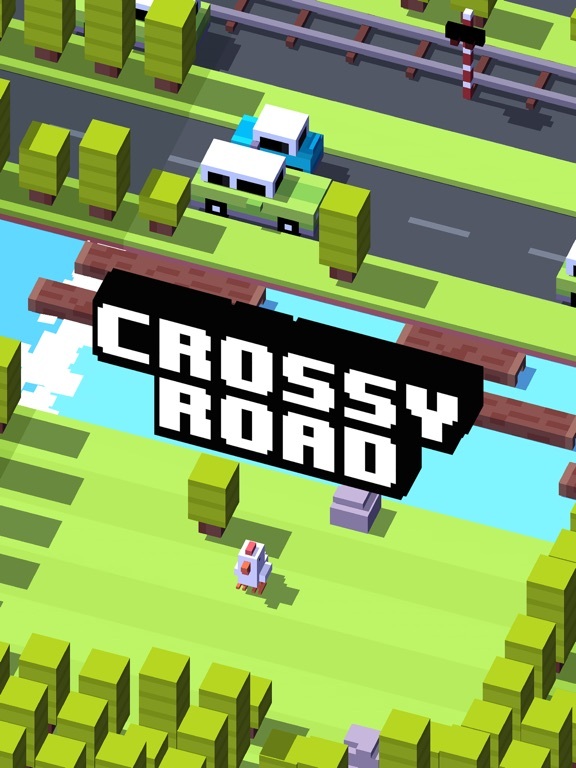 I like playing Crossy road it is fun and relaxing while I sit down I decide to play Crossy road. This game escapes me from reality. I love this game. Please never stop updating! I enjoy this game so much, and had it for years now. It’s so addicting and there are so many different characters, there are no adds, unless you pick to watch one for coins to get more characters. The app isn't hard it's simple, but it is a bit hard to get characters.... Other than that I totally recommend it! Crossy Road is the best and I don’t think I should ever go away. Why I think this is because when I play this game I feel... good and I don’t know why? And this game is a really cool and fun game so I came to write to you about how this is the best game I ever played and ever will play. I love this game because you can get this c this once you have a 100 you get a anmail!! You guys do so good creating this game I almost play it everyday lol! The pecking order daily level is a bit hard for me but that’s just because I’m a noob at this game!! LOL I love you who ever made this game! I love all the characters I get one I have 100 coins I used to play it on my kindle tablet and I have floppy fish and I loved him and I still do!! I think it’s just a really fun and cool game thanks to who ever created this game 1 million stars!! 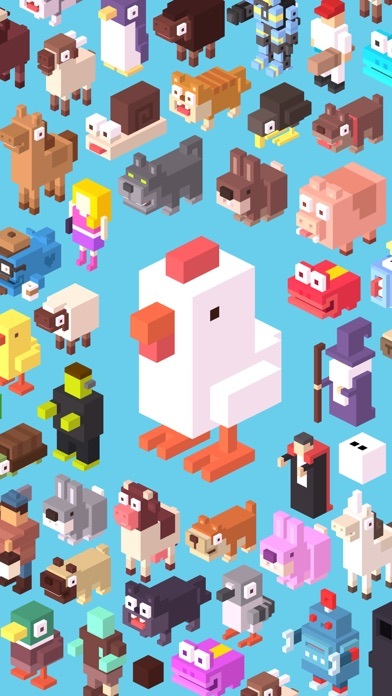 Love Crossy Road! This game is not laggy at all. I really love it. i never😭cry or throw a fit about it I just think it's, awesome! Crossy Road is so fun! I just don't like the fact that I'm the prize machine gives me only duplicates. 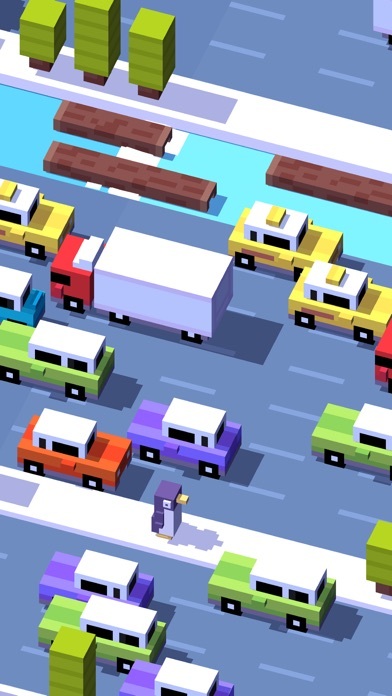 I love Crossy road! I have been playing it for three yrs and it is great. I highly recommended it. Very fun game, I enjoy playing with my friends. I get frustrated a lot and a little, which I like both. DOWNLOAD! 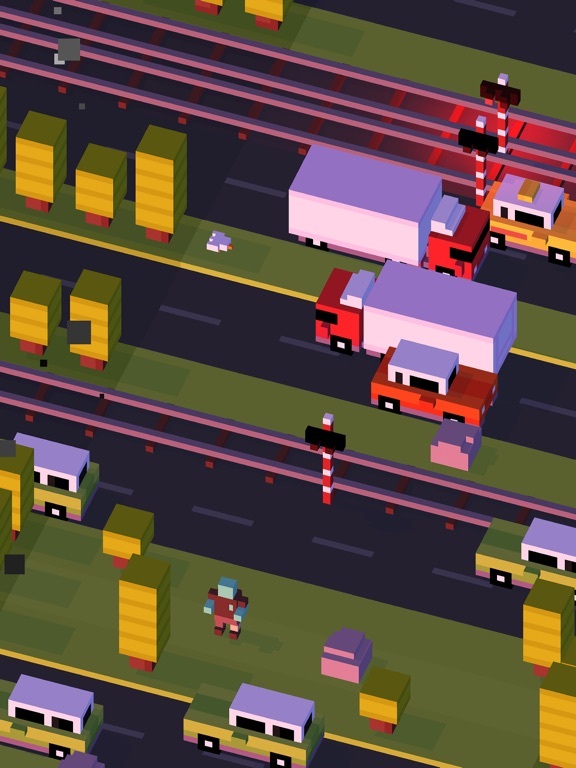 Crossy-road, have you ever played it? First off, it is a super fun game. You can win new characters! Secondly, you have to time it correctly. Or else you’ll get hit. It seems like the real world with all of the cars! I love this game! The only thing that I would suggest, is making it so you can’t get a duplicate on the prize machine. I’ve only had the game for a few weeks and I’ve gotten soooo many duplicates. Every once in a while the game gives you an option to watch a video and improve your chances, but the one time that I did that I had to watch two videos to get it to work. It was a waste of time and coins. Overall I love the game! 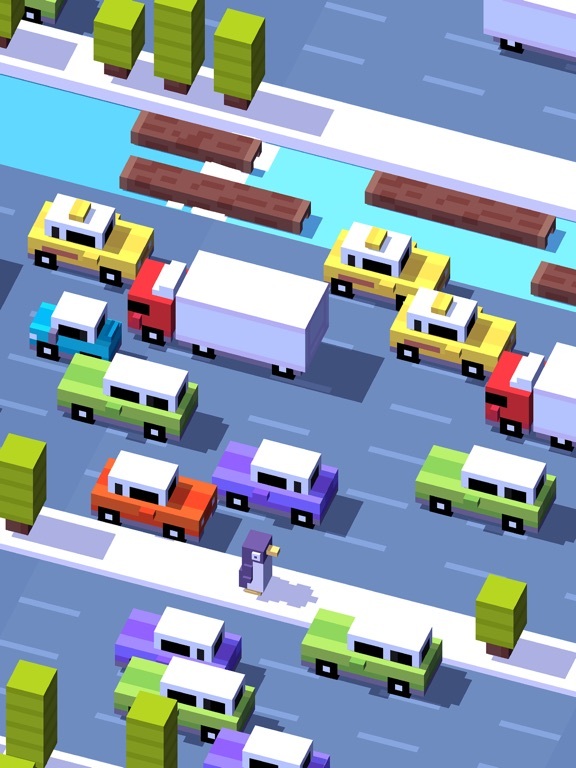 I love Crossy road. I love it! But some in the moon place please consider making some stuff easier! And the ocean place. It’s just to confusing! I love the game, I absolutely love it! Me I like to play in the morning. But when I got this game I would play on it all night.It probably one of my favorite apps. I love this game. When I am🤒😴🌫. This game helps in killing time and is enjoyable with its simple yet challenging play through and daily pecking order competition. Every time I get enough coins (100) I want a prize and every time it is a duplicate ... and it doesn’t allow me the chance anymore to watch a video and try and get a new character!! This has happened many times now. Also, I don’t have a lot of the characters either. I love this game but the thing is when you die you start over like all games but the bad thing is when it says “ FREE GIFT” it really is not free you have to pay 100 points to get that prize. But that is the only thing that I don’t like about this game pretty much other than the character that has the bomb seen I don’t like war types of games so I don’t like that character. It is a boy human. 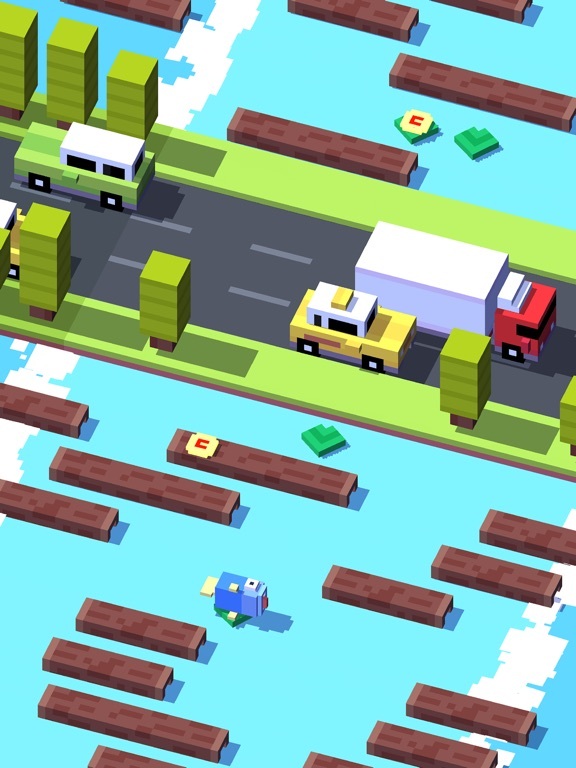 Crossy Road is definitely the most classic modern arcade game. It is crazy fun and addicting. And it feels old-school even though it’s not “well it kind of is”. I think that crossy road is a fun and addicting game i love it! Good, but sometimes too hard. The game is good and all but it’s super frustrating when you get duplicate characters. It wastes your coins. I understand that if they give you new characters, you don’t have something to work for in the game but it happens often sometimes. Another thing is that sometimes the daily challenges are too difficult, and sometimes feel impossible. I’m not sure if it’s just my lack of skill, but it is also a bit frustrating. 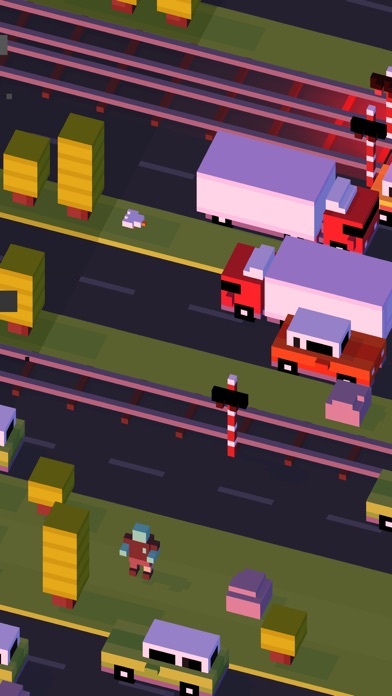 I love crossy road! Amazing! 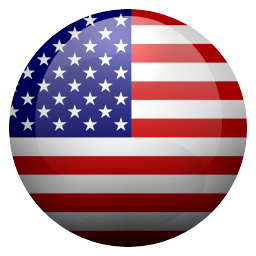 My high score is 126.Hard to beat.Get the app to beat me! Great game but plzs REVIVES!!!!!!!! This is an amazing game it is so fun and I love that you have a huge variety of caricatures. I have a suggestion though. RRRRRRRRRRRRRREEEEEEEEEEEEEVVVVVVVVVVVVIIIIIIIIIIIIVVVVVVVVVVVVEEEEEEEEEESSSSSSSSSS PPPPPPPPLLLLLLLLEEEEEEEAAAAAAAASSSSSSSEEEEEEEE!!!!! This is such a fun game but we really need revives. There are barely any ads and the way the game is laid out is great it is one of a kind but it really need revives it would just be so much better and easier. Like just one revive. Bree is how it could work. You don’t have to have one at the start but if you get to fifty are one hundred if you die you should be able to have one. So there’s my review. I am telling you the only problem with this game awesome so fun I would recommend it if you like arcade games best ever ( but having no revives) I love it! Oh and the truck exploding thing unlocks a caricature for you the truck that explodes has a big missal on it. Some times if you have a caricature that in the “friends of Crossy Road” if you step on a log that’s not a log (like the totem in the ida ones) you get a caricature. Overall my experience with this game is good, and the new Pecking Order mode is a fun new way to play and introduce competition. However, I’ve been experiencing an issue with Pecking Order not saving my previous scores. Last night I discovered the new feature, and my challenge was to play as the Mad Bull and score as many points as I could. I got somewhere in the mid-200s, then decided to leave it at that and go to bed. This morning I opened the game again and scored very low on Pecking Order only to find that my previous score had been completely erased. I wrote this off as a connection problem last night, but later I scored in the high-500s and then played some of the normal game mode, came back and scored low and found that that score had been erased. I thought maybe the game wouldn’t save your score if you switched over to the normal game mode, but when I tested this I found that the game was saving my score of 9 just fine. I don’t know if this is a personal or widespread issue, but I thought it worth mentioning here. My husband is addicted to this game. To be honest, I haven’t played it yet. However he plays non stop and he NEVER plays games on his phone until this one. I would let it frustrate me but he needs a little bit of stress relief in his busy life, although I think the game does stress him a bit, because I hear him yelling at the characters all of the time. Anyway to the practical application. He had to make a trip to our local big box club to pick up things for a cookout we were having. He said that because he had been playing Crossy Road so much it helped him navigate through the busy store with his cart much easier than usual, even though it was packed with people. I told him I was happy that he had found a practical application for his game addiction. Also, he and my 9yo are always competing to get on the leader board and my 4 yo loves it too. I suppose I should join in the family fun on this one. Lol! All in all this is a great game, but when you start to get a lot of duplicate characters from the prize machine. You then have the option of watching a video or spending 200 coins to try again and the chance of getting a new character goes up. Unfortunately, sometimes you don’t get this option and just go back to the menu screen. I find this incredibly frustrating since 100 coins were just wasted, and the probability of getting a new character becomes incredibly low. For example, I have around half the characters, and when I watch a video after getting a duplicate, my chance of getting a new character goes up to 10% then I get another duplicate, watch another video, and the chance becomes 20% after getting yet another duplicate it goes right back to the menu screen, and all the coins and time is wasted. This is a fun and addictive game that I have been playing for multiple years now. I love to use it for a time waster sitting in a doctor's office or such, and I love collecting all the characters and seeing the different themes that go with them. That said, there is a small problem that's come up recently. I play on an iPod touch 5th gen, so I know it's going to be somewhat laggy and not work as well as it might on a newer device. However, I expect to have at least a decent gameplay experience. I like the new competitions and things. The problem is when I try to watch an ad to get a mystery box, it shows the ad, then switches to a white screen, and never gives me the mystery box. Then I have to restart the game and continue on. This has happened three times so far and it's been getting frustrating. Please take this message into consideration and try to fix this! Thank you. Got this game because it was so popular and had seen all my friends play it. When I first went into the app it took a reaaaallly long time to load before I could actually play (took about 4-5 mins). This happens regularly now, even though I’ve had the game downloaded for a while. Something else that happens is lagging when I first start playing. When I hit the play button, it takes a bit for the character to respond to tapping, meaning I get hit really easily at first. It also makes me get hit for no real reason, like when there was a truck about 6 spaces away on my left and suddenly, the game lagged and froze and when it came back, that truck had hit me. Overall, a great, fun, easy game that has some lags that I’d appreciate being fixed. You should totally download this game! Crossy road is definitely one of my most used apps. It’s so fun and entertaining and a great way to pass time. But it’s super frustrating sometimes. Like if you are doing the daily challenges and you get a better score than your best score on the game, it doesn’t count it!! (Example: say my high score is 250. And on the daily challenges I get 340. They don’t change the 250 to a 340. So I have to play the “normal way” to try and beat the 340. It’s super frustrating.) My second suggestion is if you use your coins to buy a new figurine, and you get a duplicate. That’s so annoying when you get duplicates. Please please please!!! Take that off the game!! So that’s basically it. 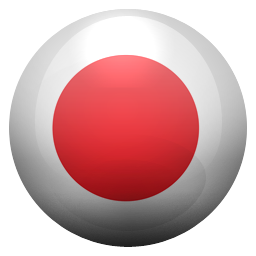 It’s an amazing app but with those little problems that’s why I rate it 4 stars!! But it’s so fun and I 100% recommend it! Thanks!! I have a friend who recommended this game to me and I thought about it and said Nah but then I played it at a Arcade and I feel in love! I got this. now but the thing is can u stop advertising at any chance u get? It would attract more people that way, and if u could make special offers more frecuente that would be cool. Also if u could socialize with people who also have the game and then u could share ur fails and records just plz don’t let there be loop holes for the chat like don’t let people space the letters in a bad word, or let them ask ur address but plz let numbers and letters but block anything that might be a address. If u could do this I would love this game so much more! If u do this plz put it in the next update! Every time you tap for your character to move, it either doesn’t move at all of just moves very slowly. We cannot predict the time when the character is going to pass the car if it’s always a few millimeters behind. When it jumps, the character moves backwards a tiny bit. When you are jumping on the logs, some of them don’t even move fast enough so you can catch them and jump on them. You can be waiting on a log and reach the edge and STILL not have a log come across your path. With the new Pecking Order you do the same map over and over again which gets extremely boring if you’re trying to get to the top. You have to go over and over again doing the same thing every single time, and it’s getting frustrating. I also don’t see a point in duplicates either. I wish overall the game had smoother and quicker gameplay. Ok so more like 4.5 . But I evidently can not do that. Reason: LOTS of ads. I mean, sometimes they are ok, like when they give you 20 coins for watching one, but, when they just pop up, it’s a little annoying. And I don’t love how you get duplicates of characters. I got a duplicate of a penguin, and it let me watch an ad( this is the only reason ads are good) to get a different character. But, it WOULD NOT LOAD. It’s was like, black on my screen for like 20 seconds, then I just closed the app. Also, I have an idea. Could you make a few new skins? These are my ideas: 1.mermaid 2.fox 3. Fish out of water ( i know you have one already, but this one different) 4. A star. Thank you if you make those! -the truth! Why do you not get to pick which animal u use even If you have most of them unlocked. I HAVE to you the stupid dice thingy. So I click it and it gives me something I don’t want so I click it again and nothing happens. So WHY do you make the dice If u can only use it once then It doesn’t work until you die using the other character? I wish it would go back to normal and we could have a long line of everything and the stuff we bought didn’t have a lock so we knew what’s unlocked. Now you have a little amount to choose from at a time. It’s super boring if you don’t get what characters you cross the road with. Please fix that. Also can we ever get humans? All I get are the weird animals. I want the humans because their better and more fun. So please make them less “ RARE” Thanks and please fix this. Crossy Road is really fun when you don’t have WiFi and don’t want to waste a bunch of data. Sometimes there are challenges and chances to use characters that would usually be hard to get. The only downside is gaining coins and getting new characters. If you’re like me and don’t like going out of your way for coins you’ll understand that getting coins to get characters is really annoying, and the only other way of getting coins (besides buying them with real money) is getting gifts, which takes a lot of commitment to play the game everyday to get the gift. And characters cost 100 coins and that’s just a chance of you getting a new character. The more characters you get the lower chance of you getting a new person. Anyway, hope this review helps you. Crossy Road is my favorite game of all time!!! I can’t stop playing it! I just wish there were more characters or you could reset the game or something. After playing it for about 3 months, I had earned 90 percent of the characters. No joke. I do however appreciate how you have to watch an ad to get moneys. It makes sense if you don’t just want to pay REAL money for coins like most other games that shall remain nameless...anyhow. Also, I wish that the Pecking order COURSE was all the same for everyone BUT an individual player could choose the character if they want. Love this game!!!! If you don’t have it, don’t waste anymore time. I really enjoy playing this game. I love how you can get random new characters very often, and you don’t have to save up your coins for very long to get a new avatar. There are almost no ads so you don’t have to wait for them to load. Sometimes it gets a little boring, but just as you are going to close the game, something exciting happens to capture your attention again. If you are looking for a game that isn’t super challenging but requires patience, this is the game for you. Lastly, anyone of any age can play without being loaded down by rules and instructions. I would recommend this game for everyone, even if you don’t like games like these. You will not be disappointed. I was super addicted to this game when I started doing the Pecking Order. I loved being able to improve my score. However, I can’t play it more than one period of time. I would play it over and over without leaving, but once I left the game for a while and came back to play, I wouldn’t be able to do the Pecking Order again until it changed to the new one. Well late last night I just played the regular mode so I could play the Pecking Order today (the Pecking Order box was showing), but now it’s not showing up at all and I haven’t tried the new one yet. Playing on normal is okay, but playing on the Pecking Order was addicting. I’m slowly starting to play less now. Kind of bummed. This game is REALLY GOOD, but there are some problems. 1. It kicks me out sometimes 2. Ads so many ads and 3. When you have too many characters and you want a prize, you may get the same character before and then choose if you want to watch an ad or use 200 coins. I think if you get the same character, you should at least get something like coins. So I need those problems fixed. Other than the problems, the game is really good. So if you people are looking at the reviews to see if the game is good, you should get it (unless you have anger issues). 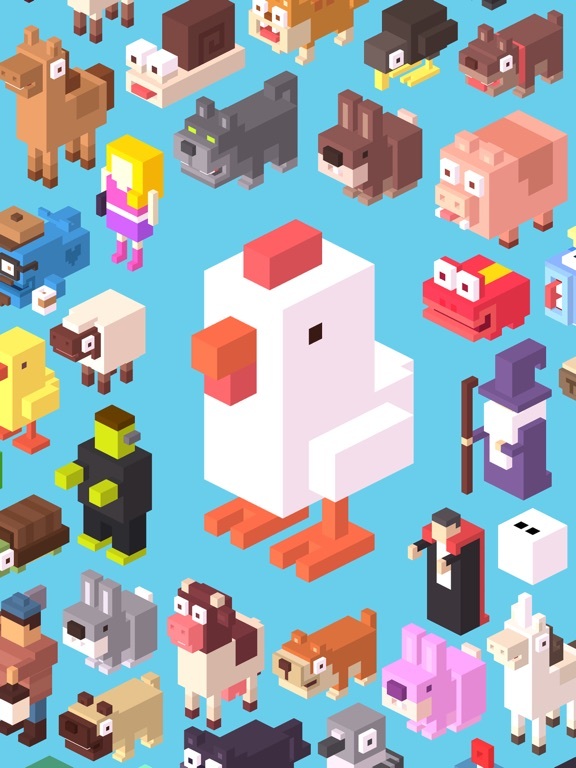 Also love Disney crossy road. Ok so I was playing Crossy Road and then I died and begun to change my character. But suddenly out of no where my coins say 446 coins? I was confused because I had 10,000 coins. But after a couple seconds it popped up on my screen and said I purchased the sloppy penguin with my coins. I didn’t touch anything but I was looking through the characters I never went to that section anyway. I might sound like a liar but if any staff see this I want my coins back and you can have that stupid penguin. The level it comes with is no better ban any other Crossy Road level. Please reply ASAP because I am sad and angry because it took hard work to earn those 10,000 coins and it took about two months of collecting also counting the fact that I have school!! I want my refund in coins and I want it quick! If you see this please contact me at my email. Crossy Road lets you “win a prize” but you’re not actually winning anything, you’re PURCHASING a prize. And here lately I’ve noticed every time I spend $100 coins, I somehow acquire a “duplicate” so therefore meaning if I want a new, different character, I have to watch an annoying ad just to get my moneys worth, ridiculous right? Here’s the best part: if there isn’t any ads/videos to watch, you’re just screwed! Lol. You get NOTHING. This scenario happened to me and since there weren’t any ads available (first of all, since when does that every happen 😂) but anyways, no videos were available to I paid an additional $100 coins after spending the initial $100 coins equaling $200 coins just to get ANOTHER DUPLICATE. It asked me to pay up to $500 for another spin but I just deleted the game and canceled any more payments to the stupid game. Addicting Warning - But really fun! 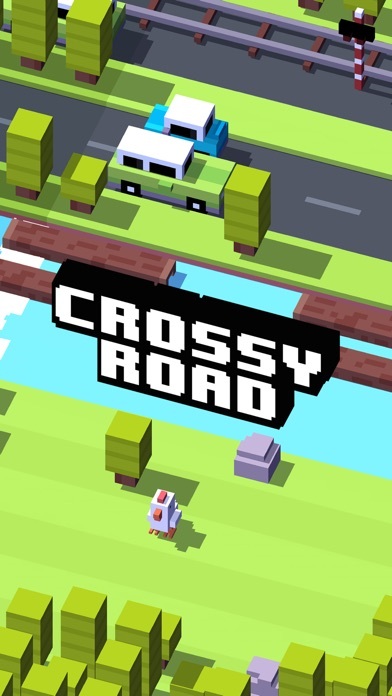 Crossy Road is a good game as a time passer on the bus or at a restaurant. It is also fun to play with friends and try to beat each others' scores, and try to collect the different sets of characters. If you get bored easily, you may not like it, as it is kind of repetitive. But for someone who likes a challenge to keep going for higher scores, it is very fun. The only issue is it takes up a lot of room on your phone, and until I got a new phone, I could not play it - very laggy. Otherwise, addictive yet fun game, and keep adding more characters for me and my friends to collect! The game overall is super entertaining and well done, but the glitches become super frustrating over time and makes you feel like they purposefully undermine your efforts in exchange for more user time. For instance, after you collect a certain amount of coins and use them to buy new characters, CrossyRoad makes you watch numerous adds and often, after wasting about 5 minutes of your time, doesn’t give you your character and steals your coins. Recently, I got a super high score only to find that it didn’t save my high score in my record. I think it’s about time CrossyRoad steps up and makes some imperative changes to their game as I am sure numerous users have requested. It’s so fun and I think it actually makes you a bit smarter! My favorite characters to play are:Poopy Pigeon because it sometimes poops and I think it’s so funny. I also liked daddy because when you step on this black thing there’s a song! I also liked Slippy Penguin because it has a unique sliding level! The only thing is is that you sometimes need to pay coins for some of the characters or you need to just randomly win them in the prize machine and to be honest sometimes I get a duplicate and I waste my coins. Sorry this is a very long review and I’m sorry I’m taking up your valuable time! I’ve had consistent issues with the CrossRoad app on iOS. The game frequently crashes at the start or completely freezes. 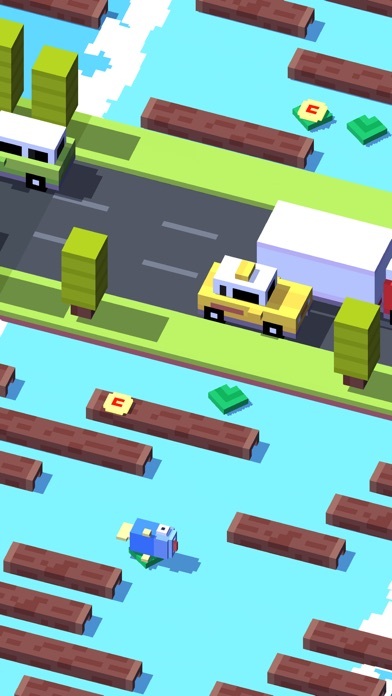 Despite following the instructions listed on the CrossyRoad site, this issue could not be resolved. The only resolution was to delete, and then re-install, the app. Thus far, I have done this twice. Each time I re-install the app, I lose all record of specific characters and coins I’ve collected. Sometimes, after repeated play, it recognizes that I’ve already collected free characters. However, it has not recognized earned coins and they appear to be forever lost. I am deeply frustrated with this issue. As a customer who has paid for the piggy bank and other items, this is annoying. If this issue isn’t resolved, I may stop playing the game entirely. I love this game and all the characters in it. Every time I’m looking for fun, I open up this app. There are some in-app purchases, but that’s only to buy characters, which isn’t a problem for me. For some other characters, you have to find them or find and item that leads you to unlocking that character, which adds some and adventure to the game. This game is simply amazing and one of the best games I have ever played. Graphics are amazing, character design is amazing, maps are amazing. I fully recommend buying this game, and if your like me, you’ll fall in love with this game(and Nessie). Overall, this game is great. I mainly did this review for recommendation and bugs. First I found a bug in the New Zealand set where there is no eagle thing, so you are basically taken away by nothing (XD). Secondly I recommend (speaking of bugs) to add a bugs set, and see how it goes. Third I think having a Medieval/Fantasy set would work well, I also think you should add a alien in the space set. Lastly I most recommend adding a Ancient, Ancient Greek, Ancient Egypt, etc. 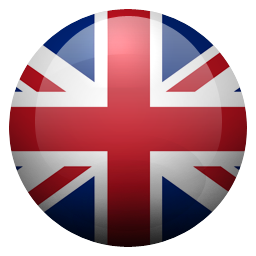 that’s all I wanted to say, and I think adding my recommendations and fixing the New Zealand bug would make the game better! It a great game but it has a few problems. I love the fact that it has a multiplayer aspect in it but you shouldn’t have to look at the leaderboard each time you play. You should only have to look at it when you want to or when you move up or down in places. The controls will occasionally act up. Sometimes I will accidentally hit touch the screen but I barley even touch it. And other times it won’t respond when I hit it or hesitate. Most of the time I have issues is when I’m in the middle of the road. It used to be better. It used to not have any problems. What happened?